The Jobu Design Surefoot SF-NX4 7" Lensplate is designed to fit monster sized lenses like the 400mm f/2.8, 500mm f/4 and the 600mm f/4, this 7" long Arca-Swiss compatible lensplate gives you loads of fore/aft adjustment to balance your camera and lens. 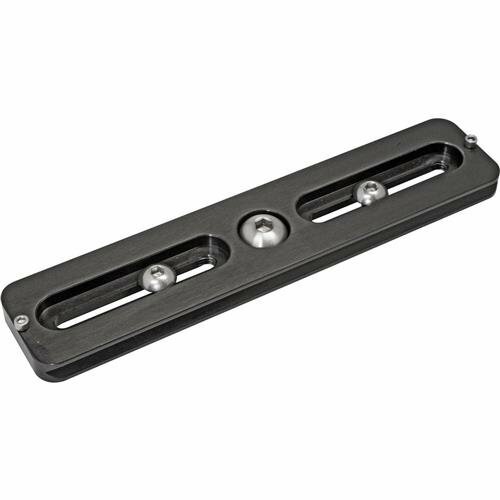 This Lensplate comes with both - one (1) 3/8" mounting bolt and two (2) 1/4" mounting bolts. No bushings are required. 2 Allen Keys (1/8" and 5/32") are included. 2 Dead-Stop bolts prevent sliding out of the quick-release clamp. Hard anodized, sand blasted finish for years of life. Drilled for fitting most popular flash brackets. If you have any questions about this product by Jobu Design, contact us by completing and submitting the form below. If you are looking for a specif part number, please include it with your message.